The 'Forbidden Languages' suite, a new set of compositions for solo SATB saxophones, is vividly informed by symbolism and mythology, and the concept of abstract, imaginary, irrational, or ephemeral language. Every stand-alone movement pushes the capabilities of the performer, and challenges the technical and expressive limits of the instrument: utilising multilayered textures, extended techniques, and physical preparations with tubes. The music is an abstraction of language, containing the echo of narrative, inflection and syntax. Each piece's micro-structural devices and gestural character are inherently linked with the mechanical and acoustic idiosyncrasies of the saxophone. A variety of energetic folk, jazz and electronic music influences combine with notated and improvised new music to expand the possibilities of the instrument. Forbidden Languages will inspire an audience to completely reimagine their concept of the saxophone’s sound and function, and is accessible enough to find one’s own meaning within the music. 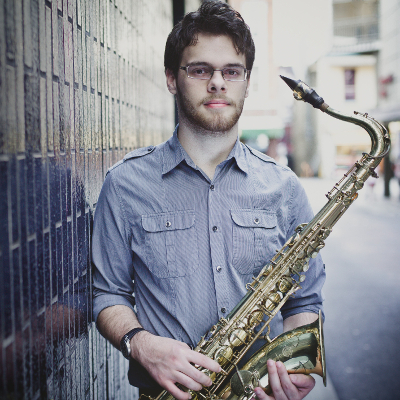 Andrew Ball is a Brisbane-based saxophonist and composer. He regularly performs with and writes for Barega Saxophone Quartet, Nomika, Cheap Fakes, and Bullhorn. Andrew has completed large-scale commissions for ensembles including The Australia Ensemble, Hourglass Ensemble, Collusion, and Queensland Youth Orchestras. He has most recently featured on Abandon Control, an album of newly commissioned Australian music by Barega SQ, and a new album of extended and prepared solo saxophone compositions titled Forbidden Languages. Internationally, Andrew has premiered compositions in France, Scotland, Italy, and Greece, including at the three previous World Sax Congresses with various ensembles. With a uniquely kinetic and colourful compositional voice, Andrew aims to challenge attitudes and ideologies surrounding the limits of context and genre. His compositional approach extends the capabilities of performers, and exploits and reimagines the idiosyncrasies of instruments.